It is unprecedented to watch one actor go from child to preteen to teen to young adult within a single movie experience. Director Richard Linklater takes a bold, experimental concept and executes it seamlessly with “Boyhood,” a coming-of-age story that is filmed over the course of 12 years, beginning in 2002. While the journey from childhood to adulthood is all too commonly explored in Hollywood, Linklater’s time-lapse film-making in “Boyhood” is a breakthrough. There are no prosthetics or makeup or interchanging of actors to convey the passage of time with any of the characters. Mason (Ellar Coltrane), the everyboy, is introduced as a doe-eyed first grader lying in the grass and leaves the film as a college freshman passionately pursuing photography. Coltrane himself grows up on screen, being filmed year after year, paralleling his character in both mental and physical growth. Mason is precocious, even early on, and tries to make sense of the world around him. Linklater’s leap of faith with Coltrane paid off, as Mason’s transformation replete with ever-evolving hairstyles, increasing lankiness and, ultimately, self-discovery is genuine and relatable. There are no gimmicks or overdramatized moments. The film is a compilation of completely ordinary experiences occurring one after another. For Mason that includes moving from place to place with his single mother (Patricia Arquette) and sister, Sam (Lorelei Linklater), taking a camping trip with his father (Ethan Hawke), enduring a bad haircut, confronting his abusive stepfather (Marco Perella), being bullied in middle school, drinking with high school friends and becoming a teenager who seeks meaningful relationships. However, the story is about Mason’s family members just as much as it is about him. Throughout the film, Mason’s mother constantly struggles to make the best decisions for her children. She is hardworking yet endures hardships, even after finishing school and attaining her desired career. She also has poor taste in men, affecting her quality of life as well as her kids. Similarly, Mason’s father is continuously trying to figure himself out. Near the beginning, he moves to Alaska and is not present in Mason’s life. He later moves back to Texas and begins developing a relationship with Mason and his sister, caring for them on alternating weekends and doing his best to reconnect with them. The snapshots here and there — many with a historical or political subtext and all viewed from Mason’s perspective — are what essentially guide the movie along. For instance, Sam is obnoxiously singing and dancing to Britney Spears as a young girl in the beginning of the film and later becomes a Lady Gaga fanatic. Mason and Sam enthusiastically dress up for the “Harry Potter and The Half Blood Prince” midnight book release. Mason’s dad expresses strong anti-Bush sentiment during the onset of the Iraq War and later campaigns for Obama. Mason and Sam are always seen riding in their father’s black Pontiac GTO when he takes them out until he eventually replaces it with a minivan after he remarries and has a newborn. No single event or timeframe, whether it’s divorce, moving away or starting high school, is explored more in-depth than the others. 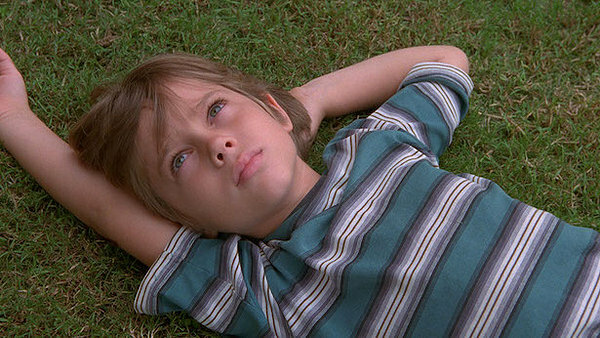 “Boyhood” is a truly unbiased timeline of Mason’s adolescence, with equal emphasis given to each event. There is no climax or focal point because Mason is always able to move on from a tough situation or adapt to change, as most of us do in life. The film takes the mundane and makes it momentous — and that’s why it works; it’s a series of moments that, together, make something grand. Originally written for Neon Tommy: CLICK HERE FOR THE REVIEW.